A black and white photograph of the Cochrane Street wooden bridge over the Canadian Pacific Railway. The Canadian Pacific Railway was built through Whitby in 1912-1914 and opened for service in July 1914. There was a wooden bridge for Cochrane Street to pass over the C.P.R. which was replaced a few times, once in 1917. In the 1960s there were discussions to replace this bridge and during the summer of 1972 a new concrete bridge was constructed to replace the old wooden trestle. 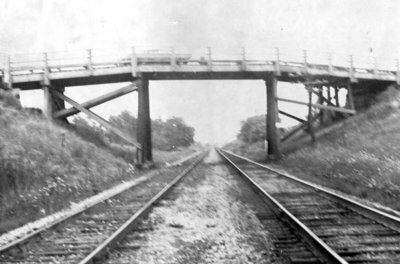 Cochrane Street Bridge Over Canadian Pacific Railway, August 1960, The Whitby Weekly News. Whitby Archives 14-004-048.